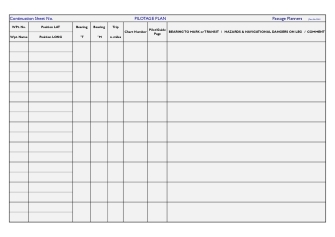 Forms to help you quickly plan your pilotage plan into your destination port. 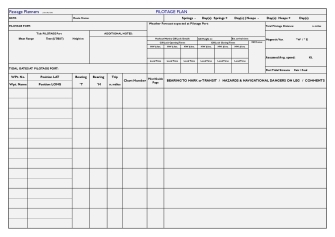 This form contains boxes to transfer tidal, passage weather, waypoint name/number, heading, trip mileage, details of possibe hazards etc. for each pilotage leg into the pilotage port. The form also includes for Cill opening/closing times where applicable. 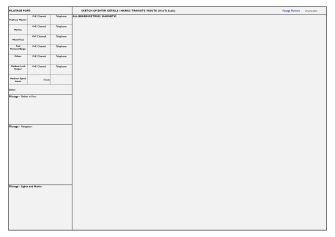 Presented with Pilotage Planning Form Page 2 on the reverse side, the forms are heat encapsulated within a premium matt plastic A4 size pouch which allows for details to be written using a 2HB pencil. Details may be altered as required by erasing and re-entering. There is plenty of space on each line to allow easy entering of detail. Use time and time again. This is encapsulated on the reverse of Page 1. It has plenty of room to sketch the main pilotage details. There is plenty of sketch space on the sheet and details can be altered as required or erased at the end of the voyage to be ready for the next pilotage plan. This is a continuation sheet to Page 1 for additional leg details to be inserted on a longer passage. Heat encapsulated as described above, with details both sides of the sheet. Can be erased and reused for the next pilotage plan. TIP - We always take a picture of each page of the plan, using a mobile phone, prior to leaving port. This insures against the plan being blown away out of the cockpit part way through the passage (it has happened to us)!! It also keeps a record of the voyage for future use.